Our brief was to create a new flexible theatre space within the existing empty ?black box? to provide seating for an audience of up to 350 over three floor levels. The general aesthetic principle was to treat the fit-out as a visually independent insertion within the existing enclosure that would only lightly touch the walls, respecting the existing space. New steelwork and plywood balcony floors form an independent structure, visually separate from the exposed fairfaced concrete walls. Details are based on a pared-down industrial aesthetic using a simple palette of materials and colour that complement the existing ?raw? space. Main public lobbies are designed to form visual marker features to emphasise their importance and contrast with the simple grey boxes of the secondary escape route lobbies and technical control room elements. Permanent seating is provided on three sides of the first and second floor public galleries and demountable seating is provided to stalls level on flexible raked rostra capable of achieving various seating arrangements. 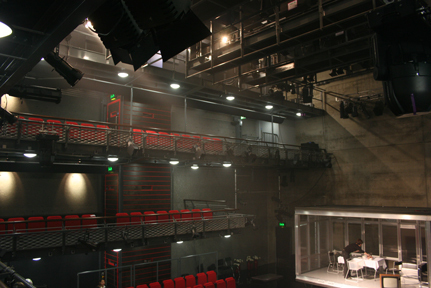 A high level technical gallery runs around the perimeter of the space linked by motorised technical bridges that track both horizontally and vertically to provide flexible lighting, sound and technical staging equipment positions.